"Holiday Homes & the Home Team"
Thanksgiving is staring us straight in the face. One would think giving thanks would be easy and stress free; have a few friends over, toast to our good fortune, turn on the tube and eat. But we all know it's not that easy, particularly for women in the family. Big decisions have to be made in advance: Is my home sufficiently "homey" to satisfy guests and family? Would I be able to serve the "right" food and prepare it like a pro? Hmmm, maybe we should travel to another family member's home, or better yet, take up that well worn invitation to visit friends in Europe? But, wait! My favorite NFL team is playing on Thanksgiving, I can't do that! Why is Thanksgiving so complicated? Have we always been so uptight? Good Ol' Honest Abe -- the President who inaugurated Thanksgiving Day as a national holiday -- certainly would not have wanted us to feel this way, would he? President Lincoln did dedicate the last day in November for Thanksgiving Day, but he is not the one who front-loaded it with the stressful expectations we feel today. That award goes to Sarah Josepha Hale. In the middle of the nineteenth century, during our Civil War, she was the editor of Godey's Lady's Book, one of the most popular women's magazines of the nineteenth century. It was filled with color fashion plates of gorgeous dresses, hats and shoes that all women aspired to wear. Hale expanded the magazine's offerings by adding interior design tips and recipes (it's ok to think: Martha Stewart). And -- going way beyond her job description at the time -- she lectured to women about how it was their job to make the home a safe, pretty "nest" for family. During the 1800's the outside world was precarious, competitive and filthy. Men, said Hale, sojourned in that world. Women, cautioned Hale, should stay inside; at the hearth, near the fire -- be industrious -- sew! 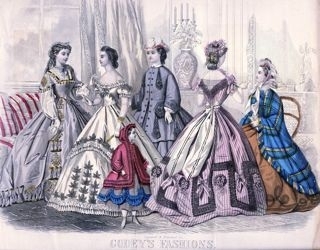 A page showing fashions of the times from Godey's Lady's Book, the 'queen of the monthlies' during 1860s America. Illustration by Copewell & Kimmel, 1860s. Men and women had always led very separate lives, yet Hale elevated a woman's role by emphasizing that they were in charge, the guardians -- morally and spiritually -- of the home and of the family. Women, therefore felt excluded and pressured to stay away from outside events such as parades, sporting events or public celebrations. This is why Hale wanted a celebration that took place in the home, a day when women and mothers, dressed in their finest Godey fashions, were at the helm. She wrote tirelessly in her editorials about making Thanksgiving, up until then a sporadic community celebration, a national holiday. Finally in 1863, one of the grisliest years of the Civil War, Hale wrote to Lincoln stating that Thanksgiving "now needs National recognition and authoritative fixation… to become an American custom and tradition." Lincoln, faced with a crumbling Union, immediately codified it as a national day and ever since then our Presidents and our Governors have issued proclamations declaring the last Thursday of November, "Thanksgiving Day." So, Lincoln codified it, and Hale was the one who packaged it with the high domestic expectations that we -- especially women and mothers -- still feel today. Even one hundred years ago, in Contra Costa County, people worried about Thanksgiving too. Should I stay home and entertain, or should I visit that long lost cousin in Los Angeles? Southern Pacific Railroad knew the pressures and advertised: "Thanksgiving Day Rates Will Be Very Low This Year." For ten dollars, or less, one could ride the train to Los Angeles, Sacramento, Fresno or Stockton to visit family, or have them come here (yikes!). If one were feeling especially adventurous and presumably wealthy, The Richmond Daily Independent advertised that it only took 68 hours to travel on a Southern Pacific train from San Francisco to Chicago but, like today, the cost was suspiciously not listed. On the day before Thanksgiving in Martinez, the 1912 Gazette heralded, "Fig Expert Here To Spend Thanksgiving." Hiron Hathaway, "in addition to being one of the best known fig authorities on this coast is also an expert nurseryman" came home to spend Thanksgiving with his sister, Mrs. A.E. Dunkel and family. I hope he brought his best suit, because people also worried about what to wear on Thanksgiving. Echoing Godey's fashion plates, The Haberdashery on Macdonald Avenue in Richmond advertised new "Hat innovations for that Thanksgiving "front." Make an impression on the old folks, breathe prosperity with one of our hats." Or, more to the point says Kurtz fashions on Macdonald and 5th: "Even the Turkey will be dressed for Thanksgiving. Why not you?" Newspapers from November 1912 are a great place to unearth what happened on Thanksgiving one hundred years ago. The Richmond Daily Independent was more business oriented than say, The Martinez Gazette or the Concord Transcript. The city of Richmond was still young and working hard to market itself as an up and coming "wonder city;" a new place filled with corporate wealth, opportunity and jobs. While Martinez advertised locals who brought in fresh mushrooms from Briones, local apples and oysters, Pulse Brothers of Richmond bragged: "Three tons of foodstuffs, comprising all of the delicacies which help to make a Thanksgiving dinner a notable event, were received here yesterday… and their coming by auto truck marked a new innovation along delivery lines for Richmond." It only took 55 minutes delivery time from San Francisco, via ferry to Oakland! Pulse then decorated their shop windows with turkeys and "various good stuff" and "trimmings in that old familiar brown and crispy manner." Customers of Pulse would have made Josepha Hale proud! It seems in 1912 no one was left without a Thanksgiving meal. The Martinez Gazette headlined that taxpayers' supported a "Holiday Feast in County Jail," and the Concord Transcript pointed out that the "State Will Be Host At Thanksgiving Feast." We may raise our eyebrows now, in our own economic hard times, but both articles were very genuine in sympathy for those "unfortunate thousands confined in the state hospitals, prisons and reform schools." Prisoners in the Contra Costa County jail were "provided the best the market affords…. Roast turkey and dressing, cranberry sauce, mashed and baked potatoes, two kinds of vegetables, pudding, coffee and pie…. Men who have been in jail here admit that they are given good food at all times by Sheriff Veale…but the prospect for Thursday's dinner is very alluring." Josepha Hale often spoke to women about the importance of living a godly, spiritual life and how it was a mother's responsibility to teach children to walk a moral path. Thinking about Hale's advice and then reading about the abundant church services all over the county on Thanksgiving morning did not surprise me. Even Pacific Gas and Electric paid for a spot in the Richmond paper that reminded us to give thanks; "we are afforded innumerable opportunities our forefathers never had." But what surprised me the most as I flipped through the 1912 papers were the number of Balls -- even masquerades -- on Wednesday night or, "Thanksgiving Eve." San Ramon and Pinole held masquerade balls. The Pullman Quartet and Band in Richmond put on a dancing party. Antioch had a ball in the Belshaw Theater and Concord's Catholic Young Men's Institute organized a "Swell Affair" in Odd Fellow's Hall; the charge was $1 a couple, supper extra and "dance floor is to be in good shape." One popular fraternal organization, that would have had Hale rolling in her grave was the "Improved Order of the Redmen." The Richmond Daily Independent wrote incessantly-- leading up to Thanksgiving -- about 'the sixth annual pow wow' at the East Shore Park where "the best music guarantees a jolly time for the lovers of the latest in dancing." At the time, the Redmen was an all-white fraternal group (until 1974) that, like most fraternal orders of the day, sponsored and supported working men. The history of this group supposedly goes back to the Boston Tea party where white men, dressed up as Native Americans, dropped British tea into the harbor. Richmond had two "tribes" signaling the abundant labor pool of the day. But they also had the "Degree of Pocohontas," which is why, I think, Thanksgiving becomes the optimum party date. In fact, the dancing party began Wednesday night when Pocohontas and an Indian Chief dressed in "original Indian costumes and presenting a very attractive appearance" marched together and symbolically opened up the event. Members of the Degree of Pocohontas, who were the daughters or wives of the Redmen, served refreshments and gave out "dainty souvenir programs." The next day, the Richmond Daily Independent reported that a throng of over 500 people attended! Given all of Richmond's "wonder city" pretense, apparently they couldn't keep their working-class population quieted down. For Martinez, what took prime newspaper space leading up to Thanksgiving Day was the big Thanksgiving rugby football game: "Santa Clara Coming In Force Thursday." This game pitted the "Rugby Fifteens of Alhambra and the Santa Clara College." Humorous football cartoons decorated the newspaper each day during Thanksgiving week and a column on Wednesday was dedicated to the official lineup showing Sheriff Veale's son, Mortimer, as the team's Captain. Nearly every day in November, the 1912 Gazette highlighted a local football event. Surprisingly enough, this football tradition also goes back to Josepha Hale's era, after the Civil War, when football became an intensely popular fall sport and playoff games traditionally took place on -- you guessed it, Thanksgiving Day! So, being a local football fan myself, I had to read Friday's paper to see who won the big rivalry, Alhambra or Santa Clara? The front page of the Martinez Gazette announced that Vallejo won in Danville and that "autos brought the visiting team to the field," but my heart went out to the people of Martinez when I read, "Santa Clara Team Failed to Arrive." Spectators -- who had purchased tickets -- and the Alhambra team waited on the field for a lengthy time. Telephone calls were made, but the Santa Clara team never responded. The Gazette tried to make light of the situation by saying that the Santa Clara team probably got "cold feet over the prospect of meeting the local champs" but all agreed that this was a very "unsportsmanlike way to act." So, Thanksgiving has never been perfect after all. And it seems like it has always been -- from its formal inception by Sarah Josepha Hale -- loaded with the importance of the home -- especially if it's the home team.